i don't actually really know that much about creamed spinach. i saw it once in the middle school cafeteria and then again in 2010 and it's not that it repulsed me or anything, i just had zero interest in it. i didn't understand a big pile of wet spinach and it didn't understand me. ok, popeye, yes, i know that, but is he exclusively creamed spinach? or just any spinach? idk. the point is, i turned a corner this winter when i finally listened to what the universe was telling me every time i entered our sad winterfell produce section: buy frozen vegetables. i just couldn't deal with all of the about-to-spoil sad looking vegetables that have to be shipped from faraway lands during the cold months. so i became a frozen spinach hoarder. our freezer became one part spinach, one part cake, and i learned how easy it is to throw an entire frozen spinach block into a pot of risotto or something and magically have vegetables. and then one day for lunch when i was in need of a salad but lacking a pile of fresh greens, i cooked up one of my little spinach blocks, and added cream, cheese, a bunch of allium things, and a bit of flour when it was looking rather thin. i wondered if it was creamed spinach. it looked like the two creamed spinaches that i had seen, it had cream in it, and it made me feel like womanpopeye at volleyball that night. without any research to confirm that what i was making was in fact creamed spinach, i decided that creamed spinach is delightful and i made it every single day for the following weeks. then last month i was out to lunch with my book agent, jonah, and i told him that we must order the creamed spinach, for i am going through a creamed spinach phase and it is my new favorite food. he might have snuck a disapproving nose wiggle into his response but i didn't notice because i was too excited for spinach and oysters. when the spinach came, ohmygod, it was so bad. sticky, tacky, pre-barfed, not creamy. it tasted like the only two ingredients in it were spinach and stickiness. ew. it was not anywhere near my vacuum-life definition of creamed spinach. we became the most grossed out versions of ourselves, pushed the plate aside, and that's when jonah came out with the truth about creamed spinach: it's bad. 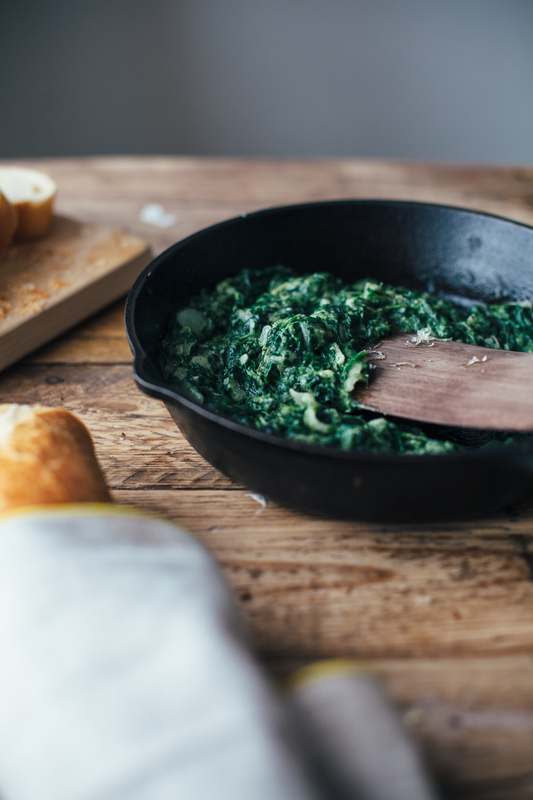 all creamed spinach is bad. that's kind of its identity, and everybody knows it. you didn't know that? i was vaguely mortified but also intrigued in the way that real housewives is bad but people still watch it. what have i been making all this time???? i thought. is this actually just spinach artichoke dip without the artichokes? 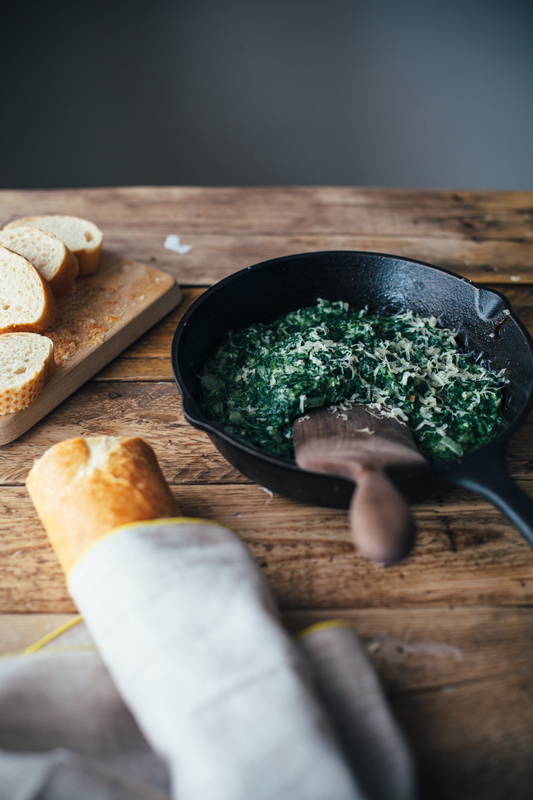 what do other creamed spinach recipes look like?? i was finally convinced to read up on it a little, and i don't think my made-up spinach was too far off the mark. spinach, cream, more cream, onions, ideally some cheese. i conducted an informal poll which revealed that there are indeed a fair amount of people that really don't like it. jonah was right. there is hope though, as there is hope in probably everything that includes cream and cheese and a correct amount of salt... right? right. it's super simple and the ingredients are easy to keep on hand. i usually use frozen spinach but if you have a ton of fresh spinach that you need to use up, you can use that too. i like eating this with a thick slice of bread or with a sausage plopped on top, eggboy likes eating it straight with a spoon. it is really important to salt this from beginning to end, and please, add as much cheese as you'd like. any negatives from eating too much cheese will be far outweighed by the positives of eating all of this spinach. update: mum says it must have a pinch of nutmeg. ok, add a pinch of nutmeg! 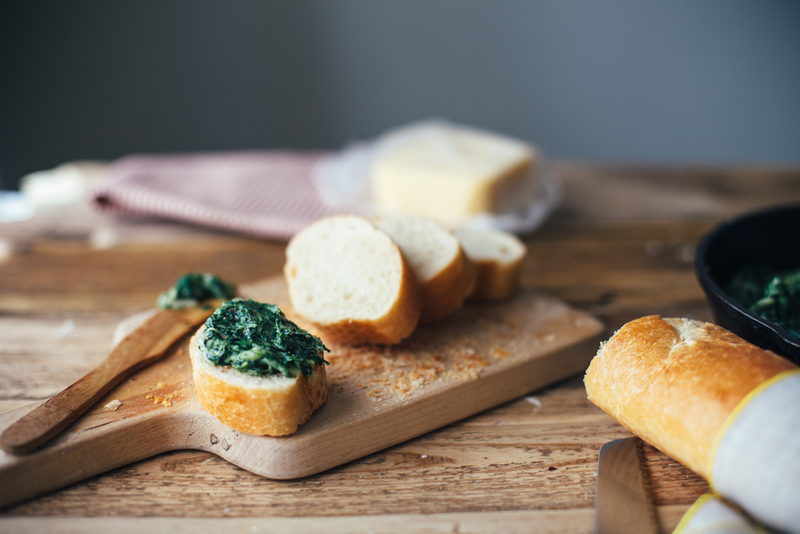 place the frozen spinach on a plate at room temperature so that it thaws a bit while you do the next few steps. in a medium pot over medium heat, melt the butter and add the onion. season with salt and pepper. cook until the onion softens, 5-7 minutes, longer if you've got the patience. add the garlic and cook for about a minute longer. stir in the flour until combined, and then stir in the heavy cream to get a thick-ish saucy thing. ok this is where things get kind of janky. (usually it's at this point when i realize that i forgot to take the frozen spinach out to thaw, and instead of dirtying up a whole separate dish to microwave it, i just put the whole block in the pot and poke at it as it slowly (very slowly) starts to soften. eventually i remove the slightly softened block and chop it into cubes and then put it back in the pot.) if the spinach is soft enough from being out at room temp, you can chop it into cubes and add it. if it isn't, you can soften it in the pot or the microwave and then chop it and add it. stir it around until it softens. add cheese, lemon juice, hot sauce, and more pepper. taste and add more cheese/salt/anything if desired. last but certainly not least, this post is part of erin's surprise baby shower!!!! lovely lady erin (or, naturally ella) is about to pop so we're showering her with easy vegetarian tasties, which is extra appropriate since not only is she giving birth to a baby this spring, but she's also giving birth to an easy vegetarian book! because she is superwoman. a totally wonderful bassoon playing superwoman who is gonna have one well-fed baby. happy baby shower, erin!!! !